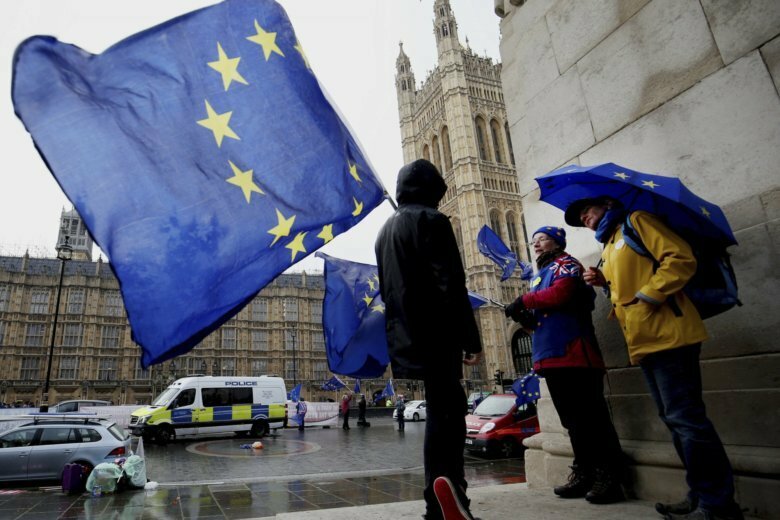 LONDON (AP) — Stockpiling of goods ahead of Brexit, already evident among British manufacturing firms uncertain about the path ahead, is coming closer to home. Households alarmed by reports of potential shortages in the event of a “no-deal” Brexit are beginning to stockpile ahead of the country’s scheduled departure from the European Union on March 29, according to a survey Tuesday by market researcher Kantar Worldpanel. The firm found that 10 percent of customers at Britain’s major supermarkets have started preparing for a disorderly Brexit, a scenario that would see tariffs imposed on products coming into the United Kingdom and other restrictions on trade with the EU. That is not yet enough to have a big impact on supermarket sales, worth around 100 billion pounds ($132 billion) a year, but it could if Brexit uncertainty persists. They survey noted that another 26 percent of shoppers say they’re ready to start stockpiling as well. Kantar, which surveyed over 7,000 customers in early February, found that 61.5 percent of those that had already begun storing extra goods were focusing on food. That was followed by toilet paper at 47 percent and medicines at 44.8 percent. Frozen foods, soft drinks, alcoholic drinks and cleaning products were also in demand. The survey also found that those who back remaining in the EU are more likely to stockpile, at 14 percent, against 7 percent for those backing Brexit. “Peoples’ attitudes to stockpiling depends very much on their attitudes to leaving or remaining in the EU,” said Fraser McKevitt, head of retail and consumer insight at Kantar Worldpanel. Britain has been gripped by uncertainty since the country voted in 2016 to leave the EU. That’s been particularly visible among firms who have had little, or no, idea what the country’s future relationship with the EU will look like and what will happen to their supply chains. That uncertainty has only increased since lawmakers voted down Prime Minister Theresa May’s withdrawal agreement with the EU in January. The uncertainty could ease next week if lawmakers back her revised deal in a new vote. Should they again vote against it, May has said they will have the option to either back a “no-deal” Brexit or seek a delay to the Brexit process. “If ‘no-deal’ is taken off the table by whatever means, then I think that’s’ immediately going to put a temporary stop to stockpiling concerns,” said Kantar’s McKevitt. In November, the Bank of England warned that if Britain crashes out of the EU without a deal or transition period to new trading arrangements, the British economy could shrink by 8 percent in a matter of months. On Tuesday, bank Governor Mark Carney said some recent “constructive developments” in preparations for a “no-deal” Brexit — a scenario that he said financial markets are putting “very little weight” on — will help cushion the blow. Carney told peers at the House of Lords that some border arrangements for traded goods, the rollover of trade agreements and improvements in derivative markets will “pull back” the scale of the recession by 2-3.5 percent. “There has been progress in preparedness and that reduces the level of the economic shock,” he said. He warned that a disorderly Brexit would still represent a “material economic shock” for Britain, not least because around half of U.K. businesses aren’t ready for a “no-deal” Brexit and half of those who have made some preparations say they’re not as ready as they’d like to be. Businesses, which operate on longer timetables than the average consumer, have had to enact contingency measures to deal with the worst-case Brexit scenarios. That’s been clear in the sharp 3.7 percent decline in business investment last year and the decision of a number of companies, particularly in the financial sector, to relocate jobs into the EU so they can continue to enjoy the benefits of the single market. Manufacturers, too, are relocating activities — Nissan, for example, partly blamed Brexit uncertainty for its decision to abandon plans to build its new SUV in northern England. A separate survey released Tuesday, from financial information company IHS Markit and the Chartered Institute of Procurement & Supply, found that Brexit-related uncertainty remained by far the biggest drag on the services sector in February, causing employment numbers to fall at the fastest pace for over seven years. “Once again this month, the lifeblood of the sector continued to leak away with Brexit indecision striking another blow to new orders and employment,” said Duncan Brock, Group Director at CIPS.